To understand variable frequency drive (VFD) better, it's necessary to explain some of the main parts of the variable frequency drive. 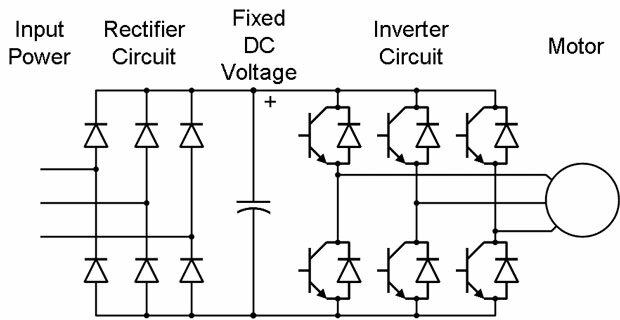 The main two parts of a VFD are the rectifier and the inverter. The first will convert the AC voltage into a DC voltage; the second will convert this DC voltage into an AC voltage with variable magnitude and frequency. So together they form an AC to AC converter tool which can be placed between the normal electric grid and a load with a special demand for voltage and frequency characteristics. 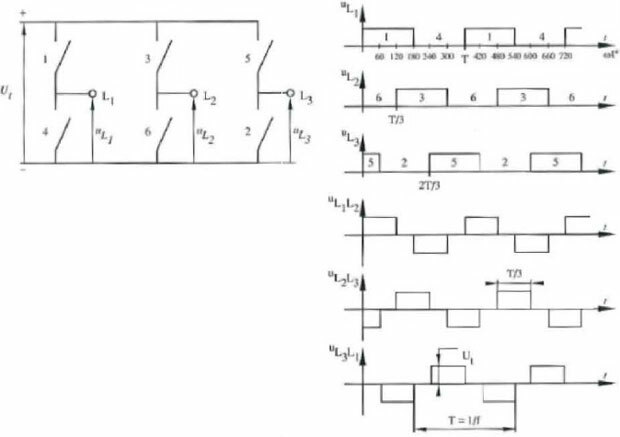 When using diodes there are still many possibilities to configure the position and quantity of the diodes to rectify the AC voltage for variable frequency drives. The current i(t) has a course like drawn in Figure 3 (a). This figure gives two important characteristics of the diode in the circuit. Like a closing switch the current will show a transition phenomenon. When the voltage becomes positive the current will be also zero because of the inductance in the circuit. 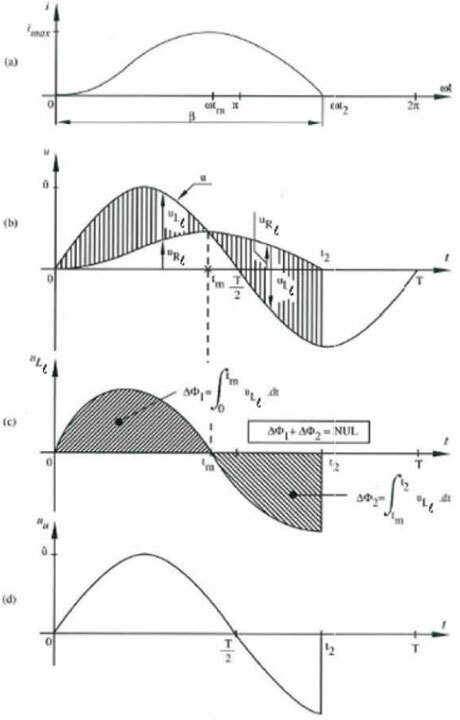 The inductance will oppose the cause of the changing magnetic field, namely the increasing current, by inducing a voltage with opposite potential compared with the source voltage. This reduces the current which can flow in the circuit of the vfd. So the current will not follow a course proportional with the voltage but will instead lag. Unlike an ordinary switch, the diode cannot conduct the current in the negative direction. When the current becomes zero, natural commutation occurs and the current becomes zero. The whole voltage is fixed over the diode. The current is rectified and by that, the voltage over the resistance also. The time that the diode conducts depends on the ratio between the inductive and resistive impedance. With a combination of inductance and resistor this time lays between fifty and hundred percent of the period of the variable frequency drive input voltage source. After this period the same cycle happens again. From 0 to tm the current increases and the voltage over the inductance is positive. From tm to t2 the current decreases to zero and the inductance induces a negative voltage. A pure inductance consumes no net energy during a whole period. This is valid here. At time t2 all the energy in the inductance flowed back into the circuit. 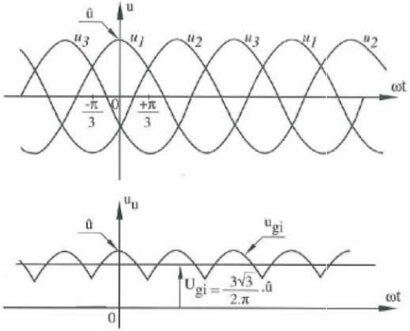 The third graph in Figure 3 gives the voltage over the inductance. When next two integrals are added, the sum is zero. This has to be because φ is the magnetic flux of the inductance due to the changing current and the net flux after one period has to be zero. This is an important characteristic of an ideal inductance and is called the equal area criterion. The average voltage is by that also zero. 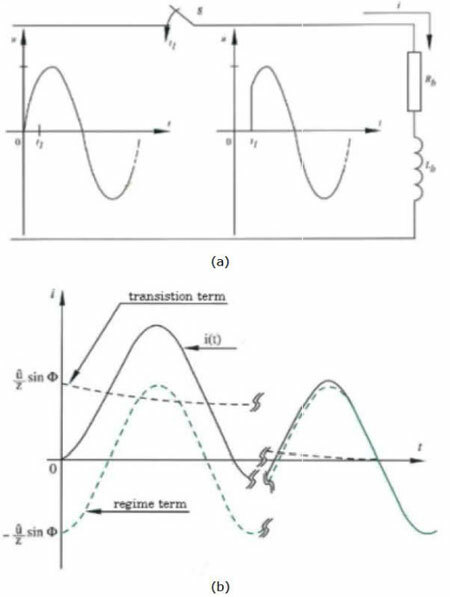 The vfd average output voltage, which is upon using the equal area criterion equal to the average voltage over the resistor, can be derived as a function of the conduction angle. This can only be solved by iteration. This is done in Figure 4. 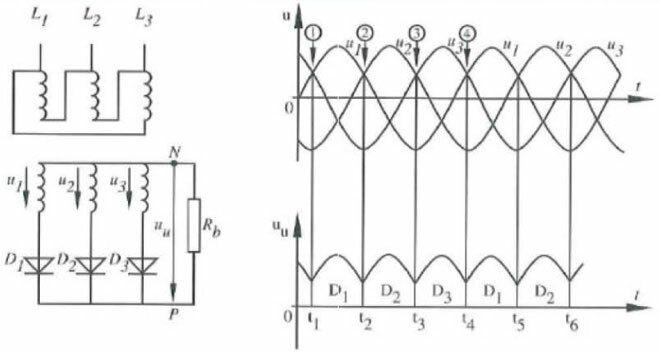 The principle of the variable frequency drive three phase half-wave rectification is capturing the positive or negative peaks of the three phase voltages by means of three diodes. The phase voltage is the potential between the neutral point and one of the phase wires. The rectifying circuit is build like showed in Figure 5. The two graphs give the three phase voltages and the output voltage. 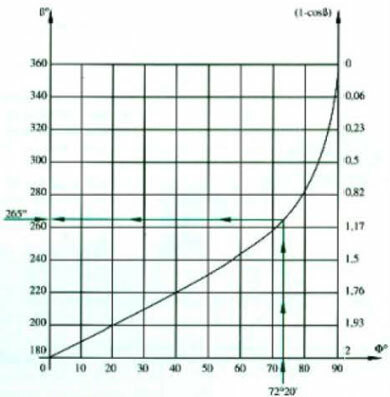 Both graphs start with positive alternation of phase voltage u1. From time t1 the voltage u1 is the highest what gives that diode D1 will conduct. When D1 conducts, the potential at the cathodes of both the other diodes D2 and D3 will reach the same potential as u1. So they block. At time t2 the voltage u2 becomes higher and from that moment on diode D2 will start conducting so that the cathode of D1 reaches the same potential as u2 and blocks. The same process happens with voltage u3 and diode D3. When the rectifying circuit is connected (here through a transformer) with the electric grid, the phase order of the grid will determine when which diode conducts or blocks. After t2 voltage u1 becomes less and voltage u2 more positive so that id1 decreases and id2 increases. 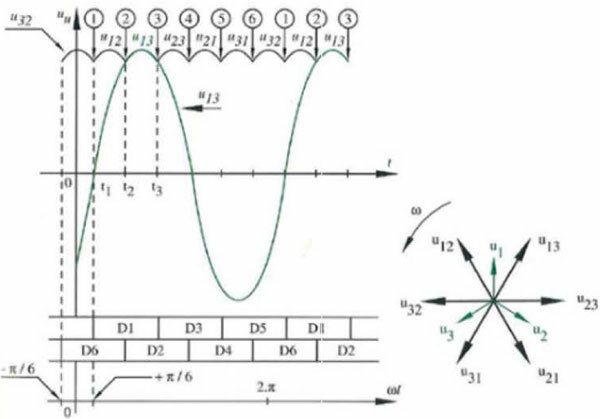 The time to completely conduct or block is determined by the inductances and the difference between uc and u2 respectively u1. A graph of this process is given below in Figure 6. The next important factor that can be derived is the average direct current component of the vfd rectified voltage Uai. This can be done by use of Figure 7. 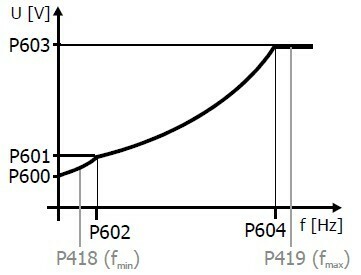 In this graph, the origin is chosen so that phase voltage u1 reaches its maximum at time zero. The variable frequency drive three phase bridge rectifier uses six instead of three diodes like the three phase half-wave rectifier. In theory it is possible to connect the diode circuit directly on the grid but often a transformer is used between grid and diode bridge. 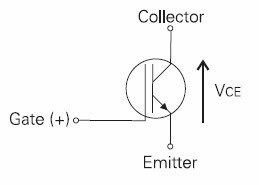 This allows a transformation to another voltage and it gives a galvanic separation. The mounting of the diodes is illustrated in Figure 8. The next important difference between the half-wave and bridge rectifier is the use of line voltage respectively phase voltage. In Figure 8 the letters L1, L2 and L3 give an indication of the three line wires. Between those wires three AC voltages are present with a phase shift of 120°. These are the line voltages. The indicating voltages u12, u23 and u31 refer to the potential between the line wire indicated by the first suffix number and the line wire indicated by the second suffix number. For instance: if u12 is positive that means that the phase voltage u1 is higher than the phase voltage u2 and by that the potential of line wire L1 is higher than the potential of line wire L2, Looking at the diode circuit of Figure 8 it is easily to see that at every moment the highest line voltage (positive or negative) stands over the vfd load. Hereby we can define line voltages u21, u32 and u13 by negating line voltages u12, u23 and u31, This line voltages answer also to the earlier given potential definition. 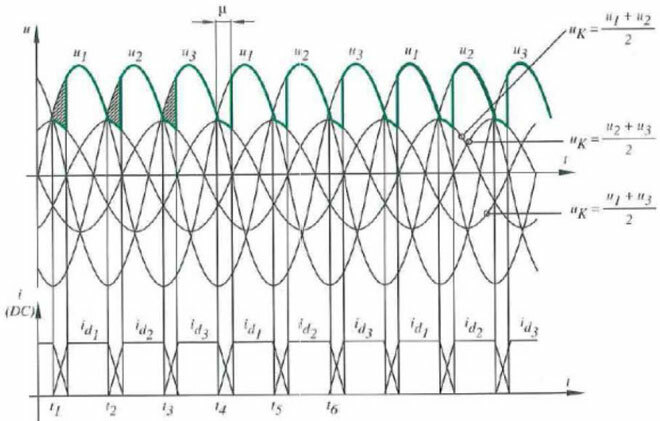 In Figure 9 the sequence of the line voltages over the lo·ad is given. When u12 is the highest voltage, that means from the moment that u2 is maximal and negative until the moment that u1 is maximal and positive, the potential over the load is equal to u12, To close the circuit diodes D1 and D6 must conduct and the other diodes block. The following phase voltage is u13, From the moment that u1 is maximal and positive until the moment that u3 is maximal and negative u13 is the potential over the load and diodes D1 and D2 conduct. The following voltages over the load are found analogous. The diodes are numbered to make the sequence 1-2, 2-3, 3-4, 4-5, 5-6 and 6-1 where after the sequence restarts.